It was easy to put together. Came just as described. My cats love it. I would buy again and recommend to a friend. Its sturdy and even with 3 cats fighting to be up top it does not tip over. Your cat will love this handcrafted synthetic rattan cat tree. 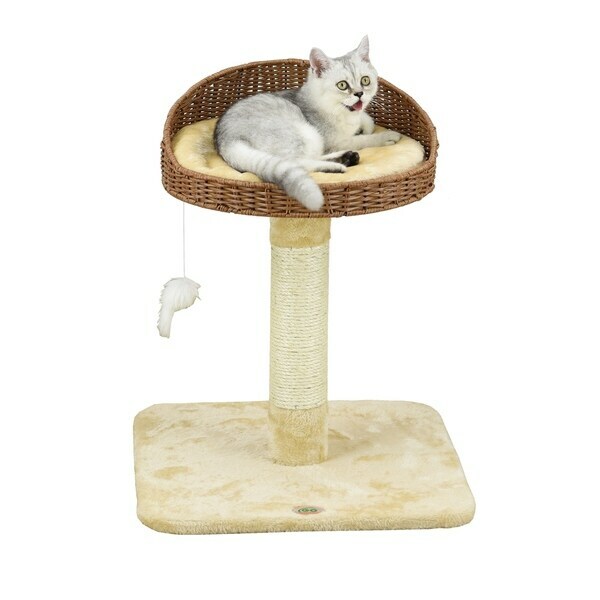 Covered with sisal rope and plush faux fur in the bed, this cat condo is easy to assembles and comes with an interactive hanging mouse toy. This cat scratching post will encourage your feline friend to stretch and play, helping keep your indoor cat active throughout the day. I've actually started sticking with this brand now as my cat really likes it, and the faux furry stuff looks better to me than most cat furniture with the carpet stuff. So I moved this one to the bedroom and bought another much larger Go Pet Club cat tree. To sum it up: My cat really loves the brand, and I don't hate looking at them either. Gotta appreciate cat furniture that appeals to both cats, and doesn't ruin your homes aesthetic. This kitty tree is so beautiful! Unfortunately my little boy has passed within a day of receiving this, buy I am happy to pass it along to my friend's cat Charlie. He will enjoy it for many years to come. My cats fight over this thing. At first my kitties didn't like. Then one day I said to my self turn it side ways. So when they relax they still have a clear view of the window. This seemed to do the trick. This is a nice perch for my kitty! Relatively sturdy and good quality however it's way too small for an adult cat. My cat wouldn't even jump on it because it's it's too small. "What are the dimensions of the basket itself? Thank you"
The rattan bed measures approximately 16 inches in diameter x 6 inches high. "What is the circumference of the perch?" The perch is approximately 3.5" inches in diameter. It is approximately 15" in diameter. It's very attractive and not cumbersome as in other cat trees. It will be very helpful to my older cat to hop on to the windowsill.